Copenhagen is famous for being a city where a lot of people bike. But for years the bike commuting rate has remained roughly steady at just over a third of trips. Then last year the city’s bike commute mode share increased from 36 percent to 41 percent. Meanwhile, driving declined 3 percent as a share of commuting trips. The detail they forgot was that the new cycling bridges aren’t finished yet, nor is the traffic calming on Amagerbrogade. The Nørrebrogade stretch is from 2008. Cycling rose on that street by 15% but that was BEFORE 2012. Duh. Bascially, there hasn’t been much carrot dangling in this city for a few years. So forget about THAT hastily thunk up theory. Things are happening NOW, in 2013 and 2014, sure, but that has nothing to do with the data from 2012 to 2013. Double Duh. What HAS happened is that 17 huge construction sites fell out of the sky all at once. Not something that happens every day. In addition, most of central Copenhagen — between 2012 and 2013 — was under further construction because of the upgrading of district heating pipes under many streets that had to be ripped up. Look at the guide at the top again. THAT is what has happened. Driving was rendered incredibly difficult. Copenhageners, being rational homo sapiens, chose other transport forms. Public transport has increased, too, but the bicycle is clearly the chariot of choice. It’s no surprise at all why cycling is booming. There you have it: If you want to improve cycling in your city, make it an awesome place to bike, sure, but don’t forget make it a terrible place to drive. Elsewhere on the Network today: Biking Toronto announces that the city is getting its first parking-protected bike lane. Seattle Transit Blog relays first impressions of new city transportation chief Scott Kubly, who was Gabe Klein’s deputy in Chicago and DC. And Global Site Plans explains how Denver B-Cycle fits into the city’s plans to reach 10 percent bike commute mode share by 2018. The messaging seems a little off with “make it a terrible place to drive.” Instead, just stop prioritizing the car over all. No more “you can have your bike lanes/greenways/plazas as long as it doesn’t remove my parking/lanes/driveways” is more what I’m thinking. Make the other modes easier to use so when it is terrible to drive, people have options. So if walking, cycling and public transit are the fastest, easiest and most convenient ways of getting around, that is how the vast majority of people will travel. So the solution is to improve our infrastructure so that walking, cycling and public transit are the fastest, easiest and most convenient ways of getting from A to B. And improve our infrastructure so that car driving is the slowest, hardest and least convenient way of getting from A to B. Implementing this solution means that, like magic, mode shift will happen! Biking is the fastest, easiest and most convenient way for me to get from point A to point B for about 80% of my trips within Washington, DC. Therefore I bike for 80% of my trips. However, the vast majority of my friends refuse to bike in DC. They all give the same reason: they don’t feel safe or confident enough to bike in traffic. While DC does have a limited number of cycletracks, as well as many miles of bike lanes, it does not have a fully connected bicycle network. It’s nowhere near as safe as Copenhagen is in terms of bicycle-car collisions. I feel safe because I have years of experience biking and I happen to not feel intimidated by motorists, generally. Until people feel safe, they won’t bike. Period. 1. 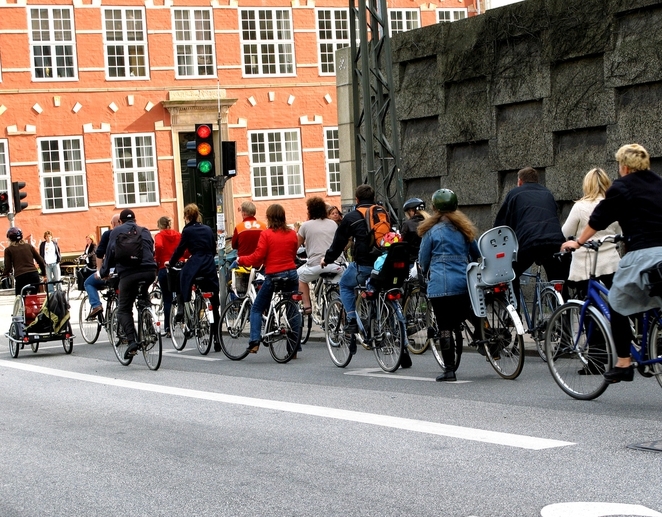 Copenhagen residents value their time, and cycling is time-efficient. 2. Car travel is neither rapid nor cheap. 3. Bicycles provide door to door transportation. 4. Security is not as much of a concern. To make matters worse in the U.S.A., we often respond to the needs of “alternative” modes with the promise that these alternatives won’t take away from single motor vehicle level of service. Plus, challenging the “right” to free or cheap parking remains the third rail of the discussion. You can’t make it easy to drive and expect people to do something else. Maybe with the Highway Trust Fund going broke, this paradigm will shift. Maybe? There may just be a dispute here as to what “convenient” means. Biking is usually most convenient in terms of parking, flexibility of travel plans, and price. But for many people, perceived collision risk makes it “inconvenient” for them. And of course, there are also cases in which climate control makes car travel more convenient, even when it is slower and harder. But much of this really is just a matter of perception. If you live thirty miles from work and have a fast road and cheap parking, that is a very good definition of convenient driving for a whole lot of people. For example. A lot of people commute by car from Santa Fe to Los Alamos National Laboratory and back because they want to live in the bigger city rather than in the small town and get paid a decent salary up in BombTowne. They are willing to pay the considerable chunk of change to commute sixty miles R/T per day (may, but not all, carpool). Bike commuting sixty miles per day, even for a seasoned racer, would be a challenge. That might be an extreme example, but I have heard of longer commutes. Biking works well in areas with shorter distances and disincentives to driving (cost, congestion, time), as Angie aptly describes. Exactly what the fabulous Streetfilm about Groningen says. Bike-transit combination could work very well if both are convenient and viable options. I have a good friend who lives in a suburb of Copenhagen but works in Roskilde, The trip length for her is about 35 km one way. She only bikes part of the way and takes the train the rest of the way into Roskilde. There are separated cycle tracks that lead all the way from her neighborhood to Roskilde for those who may choose to cycle the whole journey or some distance in between. But I doubt many people would do 70 km round trip on a daily basis for work there. And it’s not necessary because of the train system. I used to commute about 20 miles by a combination of bike and train. These extreme examples dont tell us that much about the overall commuting picture. IIRC 45% of commuters in NYC live within 5 miles of their job, which is bikeable if the roads were friendlier. Yes, yes, yes. “Making it hard to drive” is a losing political message and I don’t know why writers on Streetsblog like to emphasize it. High quality protected lanes and other bike infrastructure, including closing roads to cars, increasing filtered permability, creating urban sectors like Groningen, etc, none of it needs to be justified by “making it bad to drive”. But all of it is necessary to make it a great place to ride. The Netherlands is still a great place to drive, parking is cheap, roads are excellent, and some speed limits are higher than the US – but it is an even better place to ride – bike riding is prioritized so that many areas are not through roads for cars, and urban and residential speed limits are very low. And of course – cycle tracks when the speed limit is not very low. Roads here are pretty friendly, but the masses still drive. Its cultural, and its easy. Making it harder and more expensive to drive is what City Hall and the Bicycle Coalition are attempting in San Francisco, and it’s increasingly a losing political approach. A ballot initiative opposing this anti-car policy has just qualified for the November ballot. Redesigning busy city streets on behalf of cyclists—only 3.4% of all trips in the city are by bike—is now being challenged politically. “Making it easier to walk, take transit, and bike is what City Hall is attempting in San Francisco. It’s a challenging political approach because some changes make it harder and more expensive to drive. A ballot initiative opposing the policies that roll back automotive subsidies has just qualified for the November ballot. 3.4% of the population is somehow the equivalent of 50% of the population that directly benefits from allowing women to vote? The ballot initiative is not about “automotive subsidies” but about a predatory city government that preys on motorists as a major source of revenue. Cycling may be at 3.4% currently, but it’s an activity that almost the entire population (barring physical disabilities/conditions, infants and very young children, etc.) can do. If it was made more safe and convenient as a mode of transport, it’d be higher than 3.4%. For one thing, it would benefit people health and money wise, not to mention the slew of other benefits such as pollution, congestion, noise and injury reduction, less wear and tear on roads, less need for lots of pavement for parking or traffic control devices. But in fact people in SF—after more than ten years of anti-car, pro-bike propaganda from City Hall and the Bicycle Coalition—are not taking up cycling in significant numbers. Commuting by bike was 2.1% in 2000 and was 3.6% in 2012. That’s a big part of the problem right there, it’s not safe enough. Bike lanes alone may not help much, especially on busier roads. But separated cycle tracks would make it feel much safer for people. The intersections would take some work but that has been thoroughly tackled in several northern European countries already. I’ve never been to SF but I’d bet cycling there doesn’t feel anything like cycling in Copenhagen (which I have cycled in), whatever the topography of a particular road may be. It takes a lot more than just fanfare and promotion (without any real change to infrastructure) to get people to cycle places. . The purpose is not to inconvenience motorists. Rather bikes ride in the center of narrow lanes for safety. Safety is a very important reason and more people on the road (both motorists and cyclists) should understand this issue. Gas is expensive when you convert it to dollars because of our higher standard of living, but it’s not expensive for Danes. Gas is cheaper now than during the oil crises in the 1970s, as are cars themselves. Car sales are peaking at the moment… just not in the cities. It used to be a deterrant, but no longer. Now it is all about making driving difficult and reclaiming urban space for liveable cities. Unfriendly roads is only part of the problem here. It is 100% true that people will generally choose the fastest, most convenient mode. In NYC that is generally the subway. Even counting waiting time, the subway is quite often faster than biking, in part because NYC installed lots of bike lanes, but never gave much thought to actually decreasing travel times by bike. Safe but slow bike routes only work for people who had very limited travel options before, like walking, or maybe a very inconvenient public transit route. If we want to increase bike mode share it’s simple-make it the fastest way to get around, period, and many will bike. The only question is how to do that, but the solutions here are as varied as the environment. A hypothetical 5 mile bike trip in parts of NYC can take an hour or more thanks to a combination of congestion and very frequent red lights. We’re not going to see large numbers of people biking as long as that’s the case, even if it’s safe. To be sure, bike mode share increased quite a bit when bike lanes were installed. However, we can do a lot better if we now start focusing on travel times. We should aim to provide at least 10 mph average speeds for riders of average ability, and 15+ mph average speeds for stronger riders. Those kinds of speeds would make biking time competitive with the subway. Building multi-million-dollar parking structures in the City’s neighborhoods is not subsidy? Giving motorists the free use of the public right of way to store their private property is not a subsidy? Doyle Drive was not subsidized by all taxpayers mainly to the benefit of motorists? I’m a small business owner, and I can tell you that it is not the motorists who are asked to step up to the collection box when The City needs something done. Yes, my parsimonious diarrheist, we’ve only _doubled_ the rate of cycling in 10 years. Imagine if we’d doubled the rate of driving in that time? Chaos. Imagine if you doubled the number of people who were willing to vote for you in District elections every cycle, why, you’d be darn near a majority by the time you died! Even I would vote for you then. Riding a bike is far less dangerous than your cholesterol level, I’d bet. And you keep trotting out that one study that doesn’t even talk about the dangers of walking around — why, not only can you fall, you can get hit by a car or a stray bullet! Why doesn’t someone take these things seriously and put a stop to all that walking! “…cities reach a plateau of cycling and stay there” Except when they don’t, as the article points out. Plus, what’s wrong with hitting a plateau of cycling at 20%? More room for your precious cars. That one study that you and your two-wheeled comrades are strenuously ignoring found that SF was radically undercounting cycling injuries. We don’t know if they’ve also been undercounting pedestrian accidents, too. The MTA has 5,000 employees and they still can’t seem to get anything right. It’s more of jobs program for progressives than it is a transportation agency. What “structures” are you referring to? Parking lots and garages? They were built long ago, except for the underground parking lot in Golden Gate Park, which of course was opposed by the Bicycle Coalition, even though it was a gift to the city. All those lots/garages paid for themselves a long time ago. As it stands, the city now brings in $238 million a year from motorists. Some subsidy! No, you silly old man, the new ones that your Restore Balance comrades want to build in our neighborhoods. Let’s see, I nominate one kitty-corner to Caffe Trieste in my neighborhood, because lots of people want to visit that place. I’m sure driving will make it more convenient for everyone. Where would you like to see one in _your_ neighborhood? You still didn’t tell us anything about your cholesterol level. “Silly old man”? Are we getting into ad hominem territory here? I don’t recall any specific locations for parking lots on the petition, but it’s advisory and more of an expression of public opinion than a specific program. Now that you mention it, there are properties in the city where a parking lot and/or a garage would be a good idea. The Harding Theater property on Divisadero; the city could buy it and make a parking lot out of it. In the Ninth and Irving neighborhood, the city owns a metered parking lot that straddles Eighth and Ninth Avenues, which is a good thing for all the restaurants and local businesses in that neighborhood (Good shoe store next to the parking lot where I buy my running shoes). And under the Alamo Square park, like the underground garage in Golden Gate Park, which you have no idea is there from the Concourse itself. The Concourse garage cost $55 million, though it was private money provided by Warren Hellman and the rich people of San Francisco, who wanted parking for the new de Young Museum and the Academy of Sciences. The garage is a huge success, and after it pays off the construction bonds, all the parking fees will flow into the city’s coffers. Where’s the downside of making it easier for people—families, the elderly, the handicapped—from all over the Bay Area visit the de Young, the Academy of Sciences, and Golden Gate Park? I’ve never had my cholesterol level checked, and I never will, but I get the impression that you can provide us with your cholesterol numbers. Hmm. Better have your blood pressure checked as well. Seems a little high. Riding a bike would likely solve both those problems for you, though. Nope, too dangerous. Why don’t you give us your cholesterol numbers? I know you have them. Don’t actually keep them on hand, but my physician tells me they are well within range. • You don’t know your own health, and could even be a candidate for the leading causes of death among men, yet you want to tell people how to live their lives safely and more healthfully by _not_ riding a bike. Are you one of those people who is afraid of doctors? • You constantly claim victories on technicalities, even when, like your lawsuit against The City and the Bicycle Plan, the end result is a stunning loss that is as plain as the nose on your face. You also like to claim other people’s victories as your own, such as believing somehow that Gavin Newsom recognized your genius in seizing on the homeless issue, and rode that to victory while you never garnered more than 1.6% of the vote in your own district running on the same issue. So, blog all you want. Keep cherry-picking your statistics and studies. You’ll never be credible. I was mocking you on the cholesterol matter. Glad to hear your numbers are good. My health is fine. I haven’t owned a car in more than 20 years, I walk most everywhere and even do a little jogging. I have no reason to be concerned about my health. You seem to want to personalize this exchange, but it’s not about me or you, just like my blog is rarely about me personally. It’s about public policy issues I think are important. You question my “credibility,” but I’ve linked several important documents earlier in this thread to support my argument, and you’ve linked nothing in support of yours. I am a Democrat and was pleased the President Obama was re-elected, though he’s wrong about high-speed rail. I think Democrats are right most of the time but not always. True that the great bike revolution is mostly a “progressive” cause, and the initiative is supported by a lot of Republicans. The thing about a lot of issues—especially local issues—is that the liberal/conservative analysis is irrelevant. Typical that you claim our successful litigation that forced the city to do environmental review of the city’s 500-page Bicycle Plan was based on some kind of “technicality.” The Bicycle Coalition made the same claim, but in fact it was based on the essence of the most important environmental law in the state requiring review of any project that even might have a negative impact on the environment. I of course don’t claim that Newsom was influenced by me on the homeless issue. It was clear to many people—but not to city “progressives”—that the people of San Francisco wanted something done about homelessness. Newsom understood that and acted on that understanding. I did try but failed to influence Matt Gonzalez on the issue during the 2000 campaign for District 5 Supervisor. I of course never was able to make serious campaigns when I ran for supervisor. I just tried to influence the public debate on the issues. I was working full-time during the early campaigns and was caring for my 94-year-old mother during the 2008 campaign. But when I ran in 2008 against Mirkarimi I did get 1,900 votes without really campaigning at all, except for distributing some doorhangers in part of the district near where I live. The underlying situration is a good example of “the tragedy of the commons” – (almost) everyone maximizing their convenience by driving is ruining the “commons” for everyone – city life, the rural countryside, congestion, the atmosphere, climate, world peace… But like all such cases (overfishing the usual example) , no use appealing to conscience, the only solution is mutually agreed upon compulsion (thru taxes, parking charges and other rstrictions) But unlike the fishing the effect is too indirect so (most) motorists resist change and there are alot of them.